Over Spring Break I learned how to make homemade Udon noodle soup from my friend Erika, who is Japanese American. My family visited with Erika’s family in the San Francisco area, and we enjoyed an authentic Japanese home-cooked meal together. 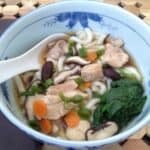 I joined Erika in the kitchen and learned that this soup is easy to make. While we were cooking in the kitchen, our kids were playing a make-believe game of cooking school. I wonder where they got that idea? Erika showed me how udon noodle soup is made in stages. First you start with dashi stock, a traditional Japanese fish stock that is the foundation for many Japanese recipes. Erika makes hers with water and instant granules, similar to bouillon cubes. Then the dashi is seasoned to complete the udon broth. Next chicken, vegetables and egg are cooked directly in the broth. Cooked spinach, cooked noodles and scallions are added to complete the soup. This dish is the kind of meal that home cooks whip together by feel and usually don’t use exact measurements. Luckily, I followed Erika around the kitchen so I was able to get approximate measurements and to write down the directions.